I still don't understand fully well the difference between the bruschetta and the crostino. 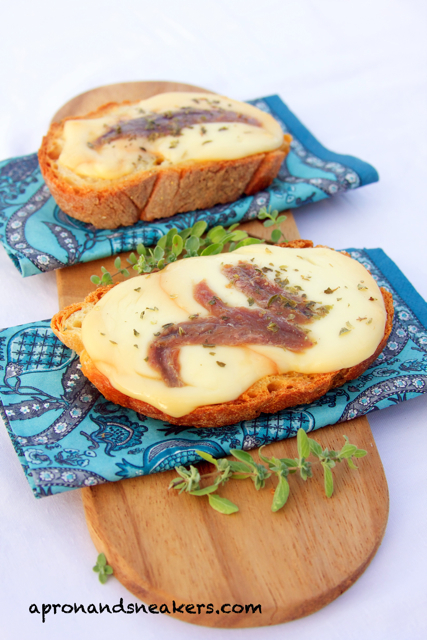 In Rome, crostini are laden with melted soft cheese, usually mozzarella or scamorza and other ingredients on top. The Tuscan ones, on the other hand, are commonly topped with liver pate', vegetables, beans, eggs, etc. They can actually be considered bruschette in Rome already. Every region has something different to say about it so it's better not to touch that subject. I live in Rome so I will write about what I know. Yesterday, I didn't feel like cooking and I wanted to have a break from my potato marathon cooking. 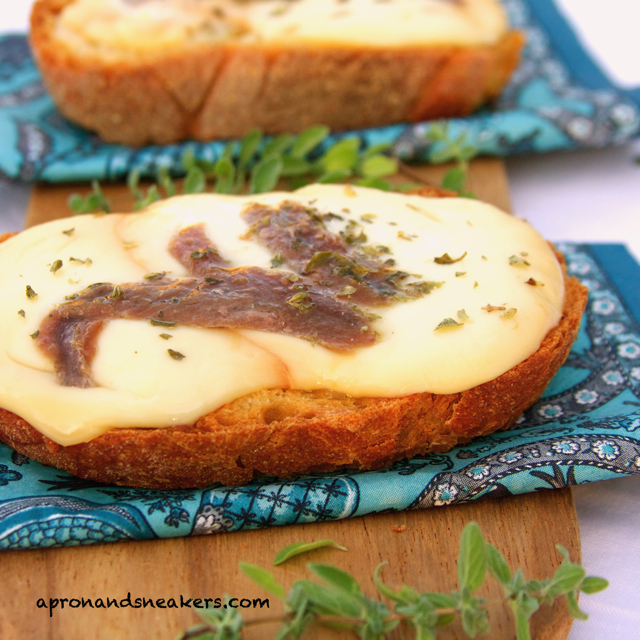 I took out all our prosciutto, cheese, bread, grissini and made these scamorza & anchovy crostini. As a classic Roman crostino, mozzarella is commonly used. I thought using scamorza affumicata (smoked scamorza) would give it more flavor. We were having pizzas in a nearby pizzeria the other night when my husband ordered crostini with mozzarella & anchovies as appetizer. I, on the other hand, don't usually waver from my usual fiori di zucca (fried zucchini flowers) so that's what I had. When I tried my husband's crostino, I immediately felt the connection. It was love! My, they were delicious! 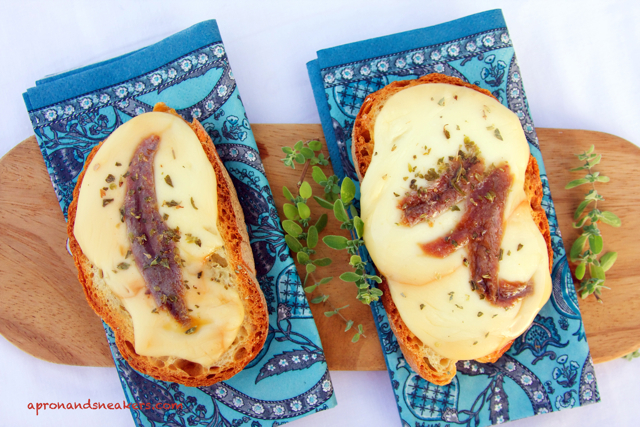 There are some who would melt the anchovies with butter before pouring them on top of the melted mozzarella. I liked the one that we had in the pizzeria so I recreated it with scamorza. And I think it is more delicious even. One important thing about the bread. We ran out of pane casareccio and we used the normal white bread for making toasts. It was a big disappointment! It became utterly impossible to eat. If you are thinking of making crostini, the quality of the bread counts or you will lose the real concept of what a crostino is all about. Toast the bread in the oven at around 180°Celsius. Put the cheese on top, covering the whole bread. Put them back in the oven until the cheese melts, between 5 - 7 minutes. Put one anchovy fillet on top of the each bread. Put back in the oven for another minute. Sprinkle with dried oregano. Serve hot.